I work two ways, the first being the most common approach to art: what I see is what I draw or paint. However, I never try to apply the realistic approach, to duplicate what I see. My philosophy is: Why copy reality? Reality can speak for itself. Reality does its own art perfectly, so why bother? My aim is to bring the internal to what I see, the feeling it gives me, the movement and psychology of it, whether it is a static object like a screwdriver, or a natural subject like a tree or the human body. Both are alive to me, and the life of it, not the precision of every component, is what I aim to create. The other approach is more improvisational. I do not plan or sketch out the piece, and use no external subject at all. Rather I use what impulses arise in me so that any ideas are then free to emerge on their own, to deliver themselves from my unconscious unfettered, unbiased and immediate. I have learned that the unconscious mind carries immense creative momentum. I find nature is far more meaningful when filtered through that realm, and form and message come through in the most startling ways. Often I start out with a single brushstroke and see where it leads me, and usually very intricate shapes occur where line, mass, color and pattern play off of each other in an almost baroque fashion. Other times I let loads of paint and oil sweep over the canvas and see what shapes appear, guiding it only by moving the whole canvas side to side, capturing shapes I like, eliminating those I don’t. These I call my “flow” pieces. After the work is done, I study it and come to understand what ideas I have depicted. In that sense, my approach is backwards. The subject matter appears afterward, when the piece is done, but always what happens in my inner life always dominates the road to completion. MY MISSION: To bring Beauty and Alternative Perception to others. By "Alternative Perception", I mean new ways of looking at the self and the world, and helping people realize they have a choice in the matter. To assist people in looking at life more Fully and with more Compassion for nature, for others and for themselves. To help bring Abundance to other Creative People. To bring Color and Aliveness to an otherwise ordinary world. MY BIO: I hail from Ducktown, Georgia, a don’t-blink-or-you’ll-miss-it town about sixty miles north of Atlanta. I moved to New York in 1980 to be an actor, but I have found that my talents have extended beyond that one career. Art is one of them and certainly the most important. I’ve also been a magazine journalist, playwright, screenwriter, club musician, and teacher, all of which I prepared myself for beforehand, but I am mostly a self-taught artist. In 2007, while on a sabbatical in Italy where I went to finish a play I was writing, I visited the Peggy Guggenheim Collection in Venice and was awe-struck by the collection there. I was completely transfixed. Something new was happening inside of me. Something very, very different. I continued on throughout Italy visiting various galleries and museums, enthralled by what I saw. I came back to New York and immediately started painting. My life was galvanized into a whole new direction. I found that non-verbal expression says far more than words do. 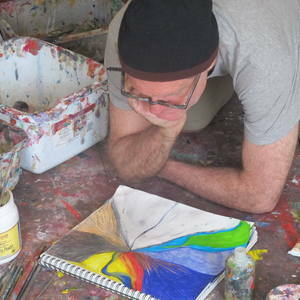 Since starting to paint in 2007, I have had more than twenty exhibitions in New York and regionally.